When Kevin Saunderson revisited his 1998 E-Dancer album ‘Heavenly’ about two years ago, he could tell that it was geared more towards the darker depths of dance music in terms of vibe and overall atmosphere. It apparently had soundtrack potential, and the thought of creating just that kept lingering in his mind for all this time. Not too long ago, it suddenly began to take shape when started working with Virus J and mixed in – or infused – live sounds. 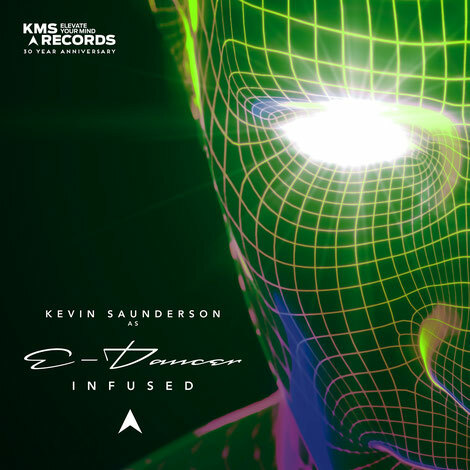 Now, it’s just been released on KMS as the first original E-dancer album in twenty years: ‘Infused’ (feat. Virus J). Radiating more of a downtempo feel through its live instrumentation, live elements and string sections, ‘Infused’ marks a new ten-track chapter in the E-Dancer narrative with a change in rhythm and tempo. One of the originators of techno and one third of The Belleville Three alongside Juan Atkins and Derrick May, Kevin Saunderson has adopted many different aliases in his three-decade career so far, including monikers such as E-Dancer and Inner City. As Inner City (and with Paris Grey), he sold well over six million records worldwide and amassed 12 UK Top 40 hits with various singles as well as debut album ‘Paradise’. He is also the founder of KMS, the record label. Born Justinas Chachlauskas, Virus J is a professional sound engineer and music producer who first embarked into the scene as a producer in 2005. Since, the Lithuanian has released an onslaught of records around the world, from a collaboration with Sandy Rivera on Defected to official remixes for the likes of T-Pain, DJ Pierre, Kings Of Tomorrow, Sultan, Deep Forest, Rui Da Silva and more, to releases on Armada Deep, Defected, Toolroom, Ministry Of Sound, Hed Kandi, Ultra and others. With his (joint) House Of Virus project, he linked up with Marshall Jefferson as well as Kevin Saunderson, which means his contribution to this E-Dancer album makes it all come full circle again.